But not any normal BMW. 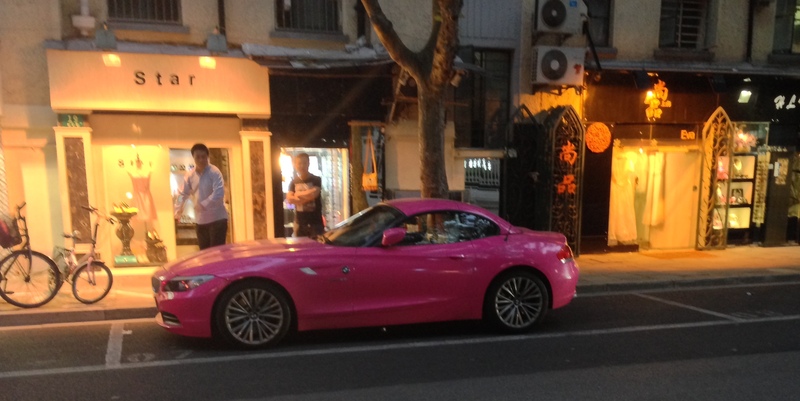 It seem to have been Hello Kitty’s private BMW. At least that how it looked like. I was shocked! The poor car. I suddenly had strange memories. Memories of my childhood. Me wearing stupid outfits my mother insisted on simply because they looked “cute” or “sweet” on me and she wanted to show those to her friends. It’s bad enough we do that to our children. But even to cars? Come on! Have German car manufacturers completely given in to bad taste? Or are they just greedy. I was flummoxed. A quick call to my father, who used to work for BMW for almost three decades confirmed my suspicion: NO! This colour doesn’t exist at BMW. If you buy a BMW there’s no way to have your car painted in this particular colour. So the paint job must’ve been conducted somewhere here in China. I hope whoever painted it asked for compensation for pain and suffering on behalf of the car…. Giving birth in Hong Kong – private or public hospital? Hong Kong – Asia’s World City. But we don’t speak English…. Deutschland – the question of nationalism vs patriotism and how a country struggles with its past….